The city attorney wants access to four years' worth of data about driver practices and the areas they serve. Dennis Herrera said he wanted to ensure they were complying with local laws on safety, accessibility and not creating "a public nuisance". 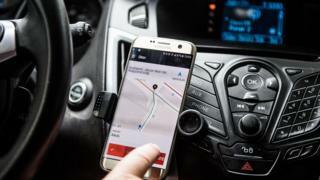 "No-one disputes the convenience of the ride-hailing industry," Mr Herrera said. "But that convenience evaporates when you're stuck in traffic behind a double-parked Uber or Lyft, or when you can't get a ride because the vehicle isn't accessible." "In San Francisco, nearly 30% of rides take place in underserved neighbourhoods and 20% of Lyft rides begin or end at a public transit station," Lyft spokeswoman Chelsea Harrison said in a statement. Uber spokeswoman Eva Behrend said that the company was "more than happy to work with the city to address congestion" but "a comprehensive solution" was needed. Uber is already involved in a legal battle with San Francisco officials, over demands that the ride-hailing company shares its drivers' names and addresses.